Introducing the You Spin Me Right Round Quilt! 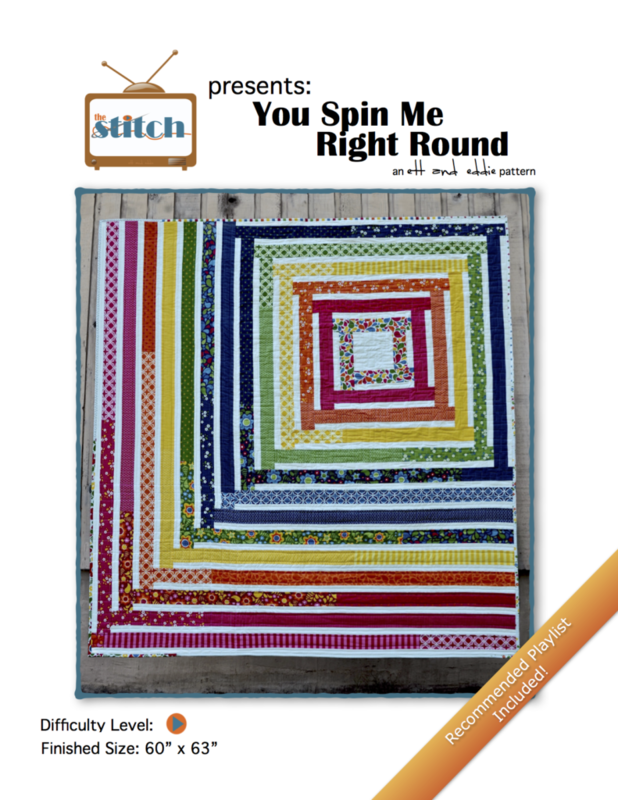 Home » Patterns » Introducing the You Spin Me Right Round Quilt! We are very pleased to introduce our fourth quilt pattern, “You Spin Me Right Round“! This quilt is very beginner-quilter friendly and very pre-cut strip friendly. Rather than focus on block construction, YSMRR (as we abbreviated during construction, because while our pattern names may be catchy, they are also sometimes long!) is built from the center out. And then it takes an off-center jaunt to finish up. The quilt measures 60 x 63″, and is made from 40 2 1/2″ strips and some background fabric. The pattern includes two alternate endings that riff on the basic construction, and a coloring page to help you plan your strip color placement. Even better, this quilt doesn’t require any specialty rulers! The playlist is rather catchy as well, although, for the record, Lynn and I do not wear eyepatches while quilting. It can hamper one’s ability to thread a needle. I bought one of those fat quarter boxes from one of the online fabric shops. The fabrics have not inspired me for anything so they sit collecting dust. This pattern would be perfect! I might have to piece the strips, but that doesn’t scare me. Wonderful design!